You can’t see me, but I’m doing a little chair dance today. My last cycle of chemo is currently infusing to my body, and I am very happy about that. I won’t consider chemo to be over until all the side effects have cleared out, but today is a momentous occasion nonetheless. I will continue to come to the RCC every three weeks for a year in order to get my Herceptin infusions, but that is a biological and not chemo. Those infusions will be much easier than chemo. The infusion itself is only 30 minutes, I won’t need bloodwork or to meet with Dr. Li prior, and I won’t see all the chemo side effects. 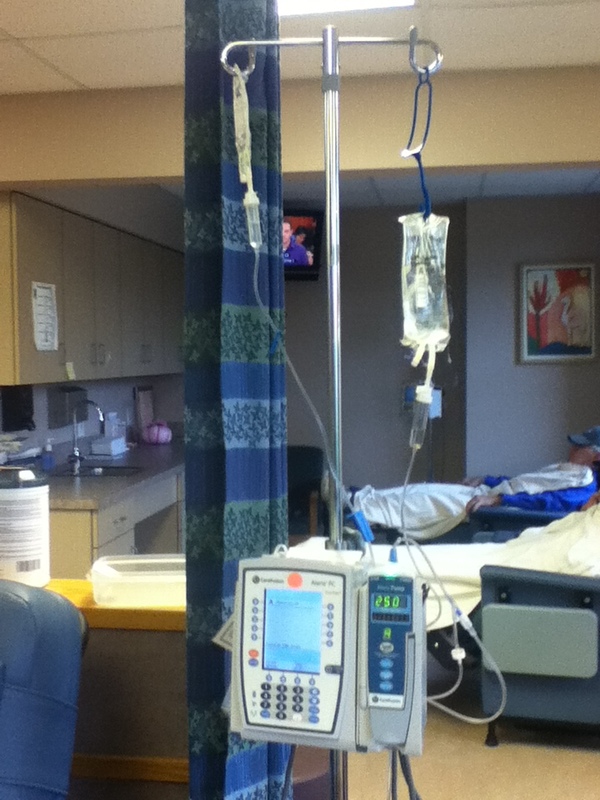 This is the IV stand an infuser for the eight drugs I get each chemo cycle. StatsGuy came with me to chemo since it was the last one, and we celebrated just a bit by ordering lunch from the Panera in the plaza across the street. 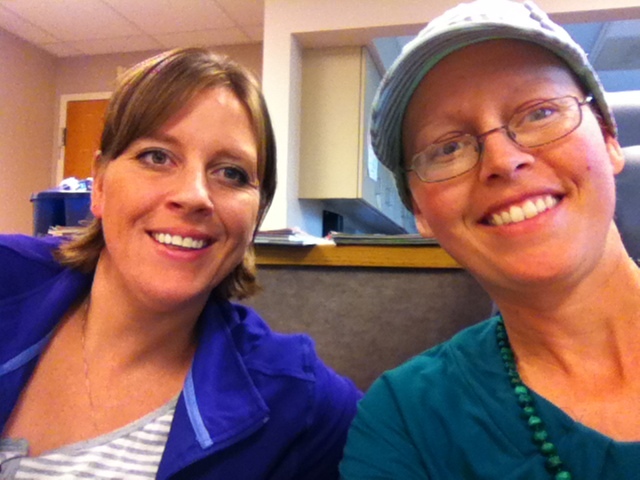 Now that chemo is about done, I’m moving on to the next treatment – surgery. I meet with Dr. Engel two weeks from today to find out how much surgery he’ll be doing and the time frame. I’m hoping for early December for the surgery – StatsGuy won’t be teaching and I have family events scheduled for Christmas. Unfortunately, not as fun as Mambo #5, but my sister came with me this time and made it as fun as it can be. Sarah and I don’t get to visit for hours uninterrupted and even talking on the phone is a lesson in Mommy Conversations, since one of her kids (being still on the young side) likes to interrupt every minute or so. All the chatting certainly made the chemo go by quickly. I was sure I had another drug to infuse, but nope – all done. Starting at 8am also helped it go faster, I think, since I was done by 1pm. Lots of time to run some errands on the west side of town afterwards. Me and my sister, Sarah. Bloodwork came back on Wednesday with no surprises. My anemia is still holding steady, with white blood cells and platelets in the normal range. My liver enzymes were still high, though. One had gone down a bit, and the other up just a touch, but since my alkaline phosphate and bilirubin levels were normal, I could still get chemo. Turns out, damaging my muscles, whether through heavy exercise or bruising, can also raise my liver enzymes. So, you’re saying I shouldn’t have dug out that root ball from a bush in front of my house? Maybe you should have warned me about that exercise connection a bit earlier. Once I feel fine, I go back to my normal levels of activity, which tend to be on the high side. Ah well, at least I know better for my last chemo treatment. Maybe I can get those liver enzymes to go down again. The other thing I learned was not to take my Zofran the day after chemo since it can interfere with some of the anti-nausea drugs they infused in me during chemo. Luckily this time I didn’t start to feel nauseous while the chemo drugs were going in, which puts me ahead of the game from last time. Speaking of last times, there’s just one chemo cycle left. I’m having a big party when this part of my treatment is done! 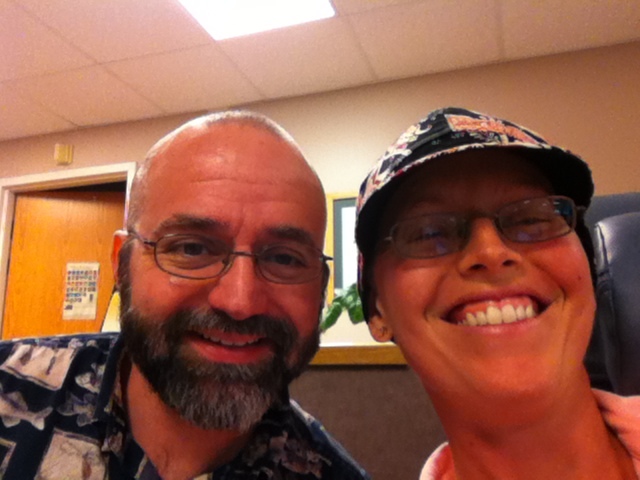 This entry was posted on October 18, 2013, in chemotherapy and tagged blood counts, chemo, liver enzymes. 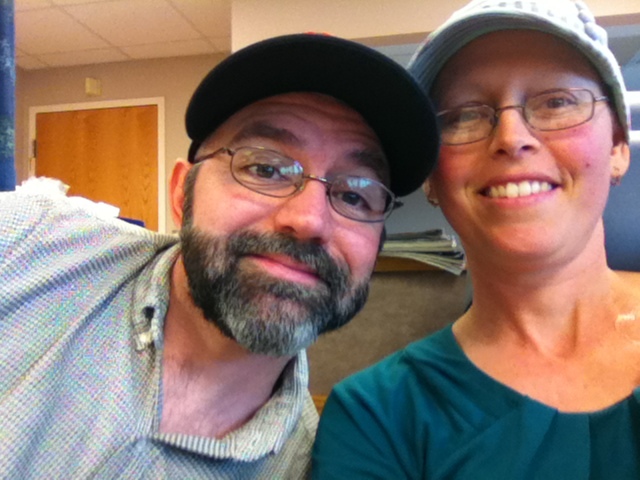 Today’s my third round of chemo, which means I’m half-way through chemo. I won’t really count it as half-way done until I’m side effect free, but I have only three more times I have to come in for chemo. That fact definitely counts as a good one. StatsGuy came to sit with my today, so it’s been very quiet as we both sit and work. I get interrupted by the occasional “Can I get you anything?” from the nurses or StatsGuy. I found this hat in Montreal. It’s reversible and solid black on the other side. I saw my results from the latest round of blood work. Good news, my liver functions seems to have improved. My AST (aspartate transferase) levels dropped back to normal, and my ALT (alanine transferase) dropped thirty points. The ALT is still high, but at least it moved much closer to normal. I guess the lack of alcohol and occasional avocado consumption seems to have paid off. I’ll keep those changes up for the foreseeable future. Unfortunately, my hemoglobin and hemocrit levels are still low. In fact, the low iron levels messed with the red blood cells enough so they came back abnormal in morphology and RDW (red blood cell distribution width). To combat the low iron levels, Dr. Li prescribed Venofer (iron sucrose) on a weekly basis. Therefore, I get ten drugs through my port today, instead of the usual nine, and I have to come back to the RCC on my non-chemo weeks for iron infusions. It also means I’m sitting in the chair an extra two hours today, which makes for a long day. What can you do. Hopefully the kids are behaving for my mother-in-law today! This entry was posted on September 5, 2013, in chemotherapy and tagged blood counts, chemo, Dr. Li.